First of all, thank you for this awesome plugin! I am facing an issue and I hope you will be able to help me. I don’t understand why and what should I do to really reset my rates to 0 (zero). Yasr comes with a kind of “caching” system, I just noticed that when the rating is deleted the cache is not. I will fix this for next version, thank you! Ok, just fixed on my development, will be released in the next release! I’m using a lot of add-ons on my WordPress site. After PHP 7.1 update only your plugin gives error message. What would be the reason? It’s not related to php version, today when I tried to commit the new releas SVN return error for a couple of min. I have been using the old GD Start Rating and I wish to migrate to a new rating plugin. My usage is mainly with user-rating multi-sets, in custom post types. I set the criteria for the multi-set for a certain post type (here “race”) to allow users to rate each post. – Will I be able to migrate and salvage the past user-rated multi-set data from GD Star Rating? – Which packages / add-ons do I need to purchase exactly? Hi, Gd Star Rating importing has been dropped out. Left you this question yesterday in my ticket on your plugin, and did not get a response. I answered but didn’t undersand why that comment needed to be approved by a moderator. Never mind Dario… sorry for being a pain. Have decided to go with this short code [yasr_overall_rating] instead. Aggregate… right? Thanks HEAPS. Hello, I have the files translated into Portuguese (Brazil) pt_BR, as shipping? Sorry, I meant author rating. I just want to display a personal review. ok, found it. Now to complete the monologue 😉 I’d like to customize the style of the multiset (blank background, no border, just the stars… If anybody had suggestions )) Thanks. Ep. 4 : Managed to get a white background fixing the stylesheet, but not sure about border and spacing… But more importantly, is it possible to get medium sized stars in multi set ? It seems only smalls ones are available. Not teasing you but I like your plugin and will definitely donate if it’s possible cos the stars are really too small for my layout on the multi set. Hello Mark, sorry for the delay of this answer. Multi Set for now has only small star size. In the next feature, and only for the pro version, star size will be customizable. Is it possible to display ranking as in Yasr Custom Rankings but adding also a thumb of featured image of post? Is possible to rate a custom category? Hello, this is not possible yet. How can i add it on my theme manually? like insert a php code? Could you give me a sample, it would really he alot thanks! Hello, sorry for the delay of this answer. You can use the do_shortcode function to accomplish this. Hi, i use yasr on my blog with the aggregateRating rich snippet. I wanted to ask, if it is possible to use both rich snippets. In the settings i can only choose between the aggregate rating and the review rating. But i want to use both different rich snippets. Is this possible? Hello, sorry for the delay of thins answer. It’s not possible to use both rich snippets, you can use only one. Is there a way to export rating data? Hello, thank you for using Yasr! This is not possible with the plugin, you should access your db and export the Yasr Tables. I’ll add this feature soon. Hello, thanks for your plugin. my website have a huge data, I installed your plugin for some days, it makes the website very slowly,. i found that there is many data is added in wordpress options table. i want to know how to remove those data in options table? thanks. Hello James, thank you for using Yasr! I guess you’re talking about of options with prefix _transient_ . I suggest to keep that rows, even if they’re a lot in your db and can be impressive, I really don’t think that this is the cause of the slow site. I have a site that has a page of audio players 10 or so on one page, can I use this plugin to let the visitors rate each file? I have tired putting the short code under each one but it seams to all have the same rating as it is for just the page id. Is there a way to use multiples on one page? Hello Dean, thank you for using Yasr! Like you guessed, the shortcode is connected with a post or page. where XXXX is your postid. The plugin looks great, but i have a small issue??? I’ve used the code for several thinks that i want to rate [yasr_visitor_votes size="small"] and when i’m rating something it automatically rates everything ales. Is it because it’s the free version??? Let me know because I really like the plugin. Uhm I think to know where the error lies: seems like your theme is one page only and the articles are loaded in lightbox, and all article are sharing the same postid; this is really wrong! To make yasr work, in this case, you should specify the postid manually, i.e. Can you assist with what that form field would be? How do i make this have stars? … which comes after each rating? Hello Patrick, thank you for using Yasr! Hello, seems like you’ve a js error in your page: can you please try to load your page with a console open? Hi, need to change the stars color and background color, please what CSS code must use? Hello Gaetano, thank you for using Yasr! The stars are .png images, so you can’t change the color sorry! This is a wordpress plugin, works only on wordpress. hello, does it work for woocommerce products? does it appear in products of shop & products page? Thanks for the plugin. Just started using it, and seems really promising. I know it is possible to allow visitors to vote on a multiset, but can we show total results of this visitor multiset as a readonly as well? To elaborate.. I have two pages, one that will allow visitors to vote, and other that will only display the voting results. I am using [yasr_visitor_multiset setid=0 postid="2645" size="small"] to allow visitors to vote for a specific post, but when am [yasr_visitor_multiset_readonly setid=0 postid=”2645″ size=”small”] or [yasr_multiset setid=0] these results don’t show the user ratings. Can you help me resolve this? This is not possible yet, but I’ll add this feature soon! Hopefully soon! that will be a handy feature. Is there a way to put visitor ratings in for a video gallery for each video? I am using Huge-it Video Gallery. This is not possible, sorry! I’m trying to use YASR on an https site, using custom stars. The page won’t load securely because the custom stars try to load via http://. Is there a way to work around this? This is pretty strange, for example this site use ssl and everything is loaded properly…do you have a link to the site? Great plugin! Is there a way that I can prevent the shortcode from automatically loading on a specific custom post type? I have it enabled for all custom post types, but in my “CM Answers” pages the shortcode isn’t getting converted. I’d rather not have it load there anyway since CM Answers has its own rating system. Any thoughts? Hello Andy, and thank you for using Yasr! Unfortunately this is not possible (yet)…the only solution (without use code) is to deactivate auto insert and manually insert yasr where you need it! Thanks Dario. What if I filter out your shortcode out of the content immediately after your plugin inserts it, based on the custom post types I choose? In CM Answers your shortcode is not getting transformed into the rating system but instead displays as raw shortcode. I may try that, unless you think it’s not possible. I’ve purchased two extensions and am excited about the plugin. I run a science fiction/fantasy/horror review blog and only want to use the ratings on posts in a certain category (“SFF Reviews”). There are almost 5300 posts in this category, so I don’t want to manually insert the shortcode. I could try doing a regex search and replace to add the shortcode to those types of posts, but I’d really prefer to add some code to single.php so I can style it as I’d like. Do you have instructions for this anywhere? Hello Kat, thank you for your purchase and sorry for the delay of this answer! Hi I’m geting an error “I’ haven’t been able to comunicate with yetanotherstarsrating.com. Most probably your hosting can fix this”. I have tried everything, deactivating/activating, adding the “Sites URL”s, “adding again the “License Keys”, but nothing seems to be working. Any help will be very much apreciated. Are you trying to do this in localhost or on online website? It is an online website. The rating stars plugin seems to be working fine because the votes, averages and everything is well displayed, but in the WP Dashboard this message is shown and every time a user votes this message is displayed (although the vote is well processed). I have disabled the “echo”procedure in the “yet-another-stars-rating-pro\lib\pro\EDD_SL_Plugin_Updater.php” file inside the “yasr_pro_check_license” function. But this is not a good solution. My 5 licenses expire on July 15, 2016. I see you’re still using Yasr Pro. Please read this announcement https://yetanotherstarsrating.com/important-news-for-all-yasr-users/ first. I like to give visitors of my website to create their own rating for a particular product (actually service) instead of a pre-set list of products they have to choose since product they like to rate might not be in the list. Is this possible? Hello Ruud, thank you for using Yasr! I’m sorry but this is not possible. I would like to know if i can manage the visitor votes. How can i see the results of the rating? If you want to edit the visitor votes this is not possible for now, you should delete it from the database. is it possible to use visitor votes for ordering in get_posts() function? Hello Igor, thank you for using Yasr! Hi, Dario, thank you for the reply. Can you please provide simple example of the query? $wpdb->get_results("SELECT v.overall_rating, v.post_id FROM " . YASR_VOTES_TABLE . " AS v, $wpdb->posts AS p WHERE v.post_id = p.ID AND p.post_status = 'publish' AND v.overall_rating > 0 ORDER BY v.overall_rating DESC, v.id ASC LIMIT 10"
ORDER BY v.overall_rating DESC, v.id ASC LIMIT 10"
I am looking at sorting the list of posts using the Average rating, is there a meta_key for this by any chance? Please pardon if my question is not clear. Hello Divya, thank you for using Yasr! Just to be sure: do you need to order the rating from shortcode yasr_overall_rating or yasr_visitor_votes? Hi guys, i’ve been running your pluggin for a while and I love it. Hello, thank you for using Yasr. I had the short code as usual and nothing gets pick up. Thanks for looking into that! Ciao Dario, complimenti per il tuo plugin è molto utile. Prima di prendere la versione PRO sto visionando quella free, ed essendo io un neofita su tutto ciò che è programmazione, volevo chiederti se è possibile inserire le stelle di votazione per diversi articoli (es: 5 articoli diversi) all’interno della stessa pagina del mio Blog? Immagino si possa fare ma non ci sono riuscito fin’ora; riesco a inserire le stelle per ogni articolo, ma se poi assegno un voto a un singolo articolo mi riporta lo stesso voto anche su tutti gli altri articoli presenti nella pagina. Sbaglio io qualcosa, sicuramente. Ciao Giorgio, grazie per usare Yasr! Qui c’è un link che spiega come trovare il postid. Ciao un altra Domanda, come e possibile o dove e possibile, a mettere und “width” personale? Adesso il mio “multi set” contiene il “width” 100% del possibile content. After some testing on a new website I want to reset all user-votes to zero. I can’t find an option to do this. Even after deinstalling of you plugin, deleting the tables wp_yasr_xxx in the mysql database an reinstallting your plugin the old votes are shown. It seems to me that yasr additional stores the votes somewhere . Hello Freddy, thank you for using Yasr! Don’t know anything about WordPress Transients until know. Will read the information behind yout link. hello! thanks for a great plugin. i have a problem though. im using the widget “most popular” but when ranking the posts i cant get the stars to shine. say i give a post 5.0 in ranking but when going to my homepage the ranking is 0.0.
what can i do to sort this problem? Hello niklas, thank you for using Yasr! I take a look into tour site and seems you’ve fixed, doesn’t you? hey, i am wondering, how can i delete AVERAGE rating under multi rating? i dont want a rich snipet..
Ho un problema…Non riesco a vedere le stelle nella pagina delle categorie (Archivio). Ho solo il testo [Voti: 0 Media Voto: 0/5]. E’ possibile inserire le stelle senza far votare nella lista dei post? Ciao Mario, grazie per usare Yasr! Si, usando lo shortcode yasr_visitor_votes_readonly. Per quanto riguarda il problema, penso che nelle tue pagine archivio ci siano errori js: mi puoi passare un link? In effetti inserisco solo il voto degli utenti. Dario pensi che il problema non si possa risolvere? Scusami, non avevo ricevuto la mail per il commento precedente! I’m struggling with your plugin to let users actually rate single posts. 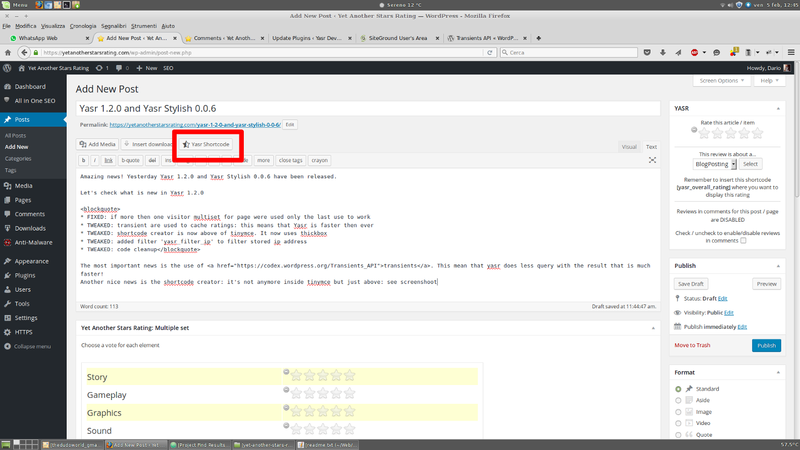 I don’t want it to display automatically nor via article editor, but I’m instead addiing the shortcode in my template. Can you help me with this, pleeeease? Ciao, ti rispondo in Italiano che faccio prima. Hello again, Dario! I was wondering if you can recommend a plugin that would enable a user who is using your YASR plugin to upload associated photos for the business for which he/she is rating. Is it possible to create a rating system where you only have a 4 star maximum rating instead of the 5 star maximum? At the moment this is not possible, I hope to develop this as extension for March. Hi Dario. Thanks for the super prompt response. I am trying to see if I can implement a work around the 5-star requirement. (1) Is there a way to change the star’s cursor hover text from “bad”, “poor”, “ok”, “good”, “super” to “absent”, “poor”, “fair”, “good”, “excellent”, respectively? (2) If necessary, is it possible to omit the “absent” ratings from the overall ratings calculation? 3) It could be possible, but it’s not a good idea to use the title attribute (that is the one that yasr use there ) for that scope. I just found your plugin and tried it. But it’s not working correctly it seems. After using your plugin, google SDT shows 7 errors. Basically this plugin is not able to fetch author, image, name, publisher, dateModified and mainEntityofPage from website to Google SDT except . Yep, I already know this happens when BlogPosting is used, I think google has changed recently something, I’ll release a fix for version 1.2.1. Thank you for responding back. In that case, assuming google’s strict nature, this plugin won’t help showing rich snippets till all the errors are gone? I suppose you’re the better person to answer this. And if you have any ETA on fix release then please care to inform. Sometimes it adds the stars in the search result even if there are errors, but every site is different. I don’t know when will be released yet, hope for the next week. Thanks a lot for this great Plugin! I dont want to have the jquery-ui.css, i want to style everything by my own. Select no at this question: Do you want show stats for visitors votes? I haven’t tested this code but should work…let me know! How do I get this plugin to let me just insert a single line star rating (i.e. 3/5 stars, for example) in the body of my posts without having to turn off auto insert? When I use the short code with auto insert turned on, nothing displays but the actual short code. Also, I installed the custom rankings extension and I had to deactivate it because it started sending me to blank pages when I tried to edit or preview posts. I’m running WP 4.4.1. Hi Brandon, thank you for using Yasr! DO you have a link to your site so I can take a look into it? Ugg, without the space in the URL, obviously. Haha. Uhm I see a lot of js error in your page…I guess that’s why rating doesn’t appear but text do. Can you please try to disable all your plugin 1 by 1? Thanks so much for the reply. I went through my plugins one by one and it seems YASR has a conflict with the NextGen Facebook (NGFB) Pro plugin. I disabled the latter for now. Hopefully a future update will solve the issues with that since I use it to push out to various social media sites. But, as you can see, even though the plugin is now letting me edit and preview pages, the short code still doesn’t work/l http://www.blu-raydefinition.com/reviews/dirty-grandpa-2016-movie-review.html I published this and the rating is blank. Seems like yasr js file doesn’t get loaded at all. This is because your theme doesn’t support wp_footer (I guess is an old theme). Simply add the wp_footer function before the closing body tag, as described in the link. Yeah, I added that to the footer, and it’s displaying the stars, but not pulling the ratings from my dashboard, just keeps showing an editable box, regardless of which short code I use. And the user rating and our rating rankings aren’t being populated or even following what’s set in the preferences. I won’t even bother with it until I update to a new theme, which I’ll be doing soon. Are there any database tables linked to this plugin? Is it ok to delete the GD rating system tables after getting it imported to YASR? Is Overall rating for admin user only? Thanks. IF you wish, after the imported is done and you’ve verified that everything was imported fine, you can delete the gd star table. Hovewer, I suggest to keep them: if gd star is disabled that tables will NOT slow down your site. I use the plugin and love it! However, I am wondering how to change the [name] tag in the scheme, which is actually the title of a post, to a shorter version when there are long titles. Any way to handle this using the short code? It’s not possible through shortcode, eventually I suggest to use a smaller font if you don’t want to edit the plugin code. Hi I have the pro version. I’m trying to add a review field on each of my product pages, so my customers can add reviews as well as rate them. I’ve tried several options but have not been successful, please could you help and advise on what I need to do or point me to a demo/tutorial? Hi Jason, thank you for using Yasr! First of all, have you read this important news? Sorry I don’t really understand. How do I enable the user to comment or add a comment form? Will this only work on posts and not general pages? Do I need to purchase another extension now to allow me to add user comments? I originally bought the pro version. If you want to enable or disable comments for the single post or page you can click on “quick edit” and check or unchek “Allow Comments”. Hi, thank you for using Yasr! There are many ways to do this: you can create a standard html div, and put inside the shortcode. Or you can use a plugin like this one, and, again, put your shortcode inside this! Thank for the plugin. Can you tell me what code to use to call a post rating in PHP? Hi Matt, thank your for using Yasr! i cant make more as 5 lizenzes work in my unli account – please check ! You’ve already rated this podcast. Now i have purchsed the pro version but i can see that the stars shown in the comment field are different from those stars hows. How to manipulate two ratings on one page….. In that page I see one shortcode, yasr_visitor_votes that is working fine. If you wish to insert more yasr_visitor_votes shortcodes you can insert the postid just like you were doing before. The stars on the comment field will be always different from the yasr_visitor_votes shortcode. It works on the comment form of that single post or page so it will rate always that single post or page. You can, if you wish, show an average from your comment field reviews using this shortcode yasr_pro_average_comments_ratings. In this shortcode you can pass the postid if you wish to show an average from another post. I was wondering if I can use this for a lot of products on 1 page. I was using the shortcode [yasr_visitor_votes size="medium"][yasr_overall_rating size="medium"] but it doesn’t seem to be working per product. It just say’s I’ve already voted for ALL of them. Anyway around this so I can allow visitors to vote on each product? Secondly, The text after the overall rating is not changing for me. I changed and saved in the settings but it still say’s” You’ve already voted this article with 5.0. Do I need to upgrade for this to work? but in search it was not displaying.what to do sir? In the Yasr settings, did you selected “Review Rating” at this question: Which rich snippet do you want to use? i have used review rating option. Ok, there is now an sure answer for this, on some site it need just a couple of hours and on some site it need 2 or more weeks. so please help exactly how long it takes and also once a post got indexed,all others will start indexing from time of i post? Here https://developers.google.com/structured-data/rich-snippets/ you’ll find all your answer. In the free version there was no bottom line something like: “page title” written by xyz average rating … etc. It would be nicer without the line but it seems to important for the Google SERP is that correct and only ratings of the pro version appears in the SERP? I have done some testing and clicking myself. Where can I reset the counter and start new to eliminate my votes? Hi Micheal, thank you for buying yasr pro!! Both version has the rich snippet, I guess you were using yasr 0.9.8 that use only json-ld instead of microdata: that’s why you didn’t see the sentence at the end of the post. Hovewer, from version 0.9.9 (and version 0.5.1 for the pro) yasr support both microdata and json-ld, with microdata as default, this because json-ld is not yet fully supported for the review. You’ve to login in your database, and delete all the raws in the table PREFIX_yasr_logs and PREFIX_yasr_votes . Remember that to get faster support you can subscribe to the private forum that is linked in your purchase receipt. Thank you Dario, this support is als extremely quick. Maybe the post didn’t have the rating? If, for example, in the settings “Review Rating” is selected as default rich snippet, but the article hasn’t a rating (the one showed by the overall_rating shortcode) the sentence doesn’t show up at all. Same thing for the aggregate rating: if no one has rated on visitor_votes shortcode. For a multi set, is there any way to show the average for each row instead of just one overall rating? Maybe pulling in the data from the tables some how and echo it out on single CPT and CPT archive? Reviews in comments disabled” — How can I make this enabled by default for all CPT posts? 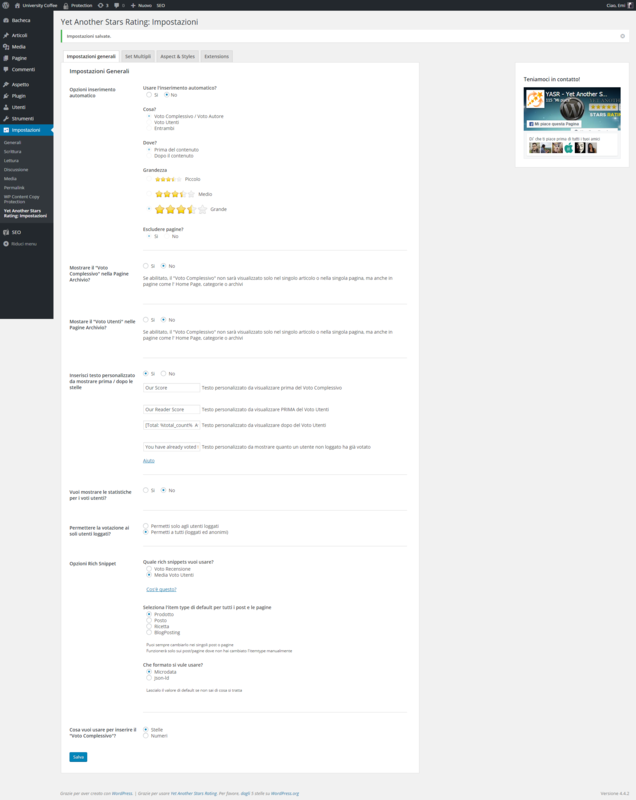 Review Summary ” — I dont need the extra rating field, I need the comment field to go along with the multi set reviews. How do I change this? Also the stars for overall rating are still grey after submitting review. Did you rated it on the edit screen (see video tutorial) and later [yasr_overall_rating] shortcode still gray? If so, can you please post a link to your site? Hi, thank you for your purchase! Did you rated it on the edit screen (see video tutorial) and later [yasr_overall_rating] shortcode still gray? If so, can you please post a link to your site? — I didnt rate it on the edit screen. Users will not rate the posts on the backend, it will be done front end, so overall_rating will not be useful. I will need the visitors ratings. 1 & 2b — Do you have an expected date for the release? 2a. — Wont this enable it for all post types though? I just need it for one post type. great plugin. But I have an issue. On some pages (3 of 20) the plugin put an extra div in the html code. After this, the sidebar is not right on the content, it is under the content, on the bottom. If I disable the plugin, everything is ok. Please try to update the plugin to version 0.9.5. Is there anyway to remove the restrictions to rate? How would I allow visitors to rate and review multiple times on a sample page or post or custom types? Hi, this is not possible by default, but a non logged in user can vote again simply by deleting the cookie. A logged in user can always update their vote. I would like to know if there exits the possibility to use and see the same [year visitor votes] element on the same page after changing the language. I have this issue: After changing the language all the data regarding the same [year visitor votes] seems to be different, like if the user was in another page. if when you change the language it change the post_id too, it’s not possible, sorry. Instead of the full DIV. I bought the full version, and will be glad to make it work on my theme :/ (i can give you my website address if you need it). Hi, sorry for the delay of this answer. Can I see your site? I tried on this page! You should be able to see the website now ! Sorry for the delay of this answer. I don’t think is related,but can you please try to fix this before? Thanks for your answer !! What happens if you try to insert it outside? We managed to enable regular comments in our posts, but user reviews don’t show up yet. Can you show me an example site where I can place a review with stars and a user comment? I can also send you a login to our site (by e-mail) if you wish. That comment form seems like a non standard one…did you tried to use another theme, and see if it shows up? There is a standard hook in this theme “comment_form_after_fields”. I suggest asking the author why they are not using that hook or just ask what hook they are using. Thanks, we’re getting closer. Solution was to remove some custom CSS code that was used to ‘clean’ our search results. Hello Dario, thanks for great plugin. How can i align YASR shortcode to the right? Hi Antony, thank you for using YASR! We just purchased the Pro version and are about to set it up for BuddyPress/bbPress setup. I plan to add ratings for postID and threadID. I know I have to do my own code in the_loop() and that’s fine. I have a feature request that has also been mentioned in this comment chain and I wanted to tweak the suggestion in a way that makes sense. User Ratings – The tweak is to use something similar to $overall_rating, except instead of averaging just the ratings for that post/page/type, alter it to average the all ratings where the current userID was the content creator (recipient of the rating). Simple and effective. We can now add ratings to user loops so I can display user ratings in the forum under each user’s avatar/profile info, on BuddyPress member profile pages showing each user’s ratings in their profiles, or ANYWHERE there’s a loop for member info. It’s not a full-blown user-rating addition, it’s a much smaller tweak to just check for average ratings of all content created by the current userID in the content loop. where/where now X (catID, for example) so that you could narrow down user ratings a little better if you don’t want certain content ratings to be counted/averaged for a user’s overall content rating. This feature ( I hope I explained it in a way that makes it clear and easy to implement) coupled with usage inside custom content loops makes for an almost limitless amount of possible uses. I would love to see this in the near future if at all possible. Hi Matt, thank you for buying YASR PRO! We are trying YASR free version before purchasing PRO one. On our website we have many categories (grocery stores, electronics stores, bars, restaurants, clothing stores and so on), can we somehow use [yasr_top_ten_highest_rated] for each category separately? Plugin is great! Keep it on! Hi, Aleksandr, thank you for using yasr! Can we remove background on multiply ratings (user_ratings and top_ratings)? Can we make [yasr_top_ten_highest_rated] more than 10? Let’s say 50 or maybe 100? I’ll fix this in the next version, thank you to sharing this! Hope for Your fast reply! But can we somehow make it always visible and always vote-able? All 3 rows? This is what we need 🙂 Check our website and you will understand. Also would be nice to be able to let people revote in like one month… Possible? I am thinking if we will understand each other right. Of course some people may want to vote for only one or two criterias, but others may want to vote for all criterias (but others can’t see them after someone votes for one only). And we would like criterias to be always visible as if I would just vote for all three even if I didn’t. Yes, I can confirm this bug, I’ll fix it asap! Only the best wishes, Alex. Now, we want to set some values but we can not do it. How is it possible to display only numbers for the overall rating? Id like to have it so on the home page it displays the overall rating for a post like “7.2” but just the number? hello, it works, kinda of. Now all i have is “-1” on the home page. Hi, -1 appears on the page where you haven’t voted. Does it works good on single post or page? Can i rate the article author instead the article? how i can do this? the [yasr_visitor_votes] shortcode support parameters? Hi, what you need it’s not possible, the only place you can insert the yasr shortcode outside a post/page is in the loop. Hi Dario, I have created several unique posts and given them ratings on their post pages. Now I am looking to refer to their rating on the homepage of the website — is there shortcode to do this or another way to accomplish this? Thank you. Hi Alex, thank you for using YASR! -Show “Overall Rating” in Archive Page? -Show “Visitor Votes” in Archive Page? Thanks for the response! I was actually trying to ask if there’s a shortcode to manually display a star rating (4 1/2 stars, 5 stars, etc) without it being attached to a specific item. I have a post that is a review for a product, and a 5 star rating there. I mention the same product on another page alongside several others, and wanted to display it’s ranking next to it, however on this new page if I use the [yasr_overall_rating size="small"] shortcode it just results in a rating of ‘-1.0 out of 5 Stars’. Hi, I would like to know if there is any way to add the star rating to your post excerpt? Hi, I tried this but only the text is in the post excerpt, not the images of the stars, how can I do ? Thank you ! Hello, thank you for using Yasr and sorry for the delay of this answer. Is there a way for a bit of code to be added to a page template instead of using shortcodes? The theme I am using is not working with shortcodes. Hi, using the do_shortcode functions you should be able to make it work. Do you support more than 100 multi rating pages for the pro version? So you mean the multi set or what? You can create up to 99 different multi set (you can use multiset in every post or page you want, there is not limit) and each multiset can have up to 9 voices. Can I go over 99 though? My site requires 100+ and more. And this is 1 multi set. Each multiset can have up to 9 different rows. . You can insert each multiset in every post or page you want, limitless. You can create up to 99 multiset. Do you really need 99+ multisets? I like your app so far, I am trying to start a review site. Is it possible to have a page which lists the top rated places or products with a certain tag? For example I would like to have the top rated bars which i reviewed tagged with NYC, but not all the bars I rated. Do you understand what I mean?